Our referral giveaway ends next week! 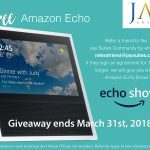 It's your last chance for all referrals that apply to be rewarded with a free Amazon Echo Show. Don't miss out! 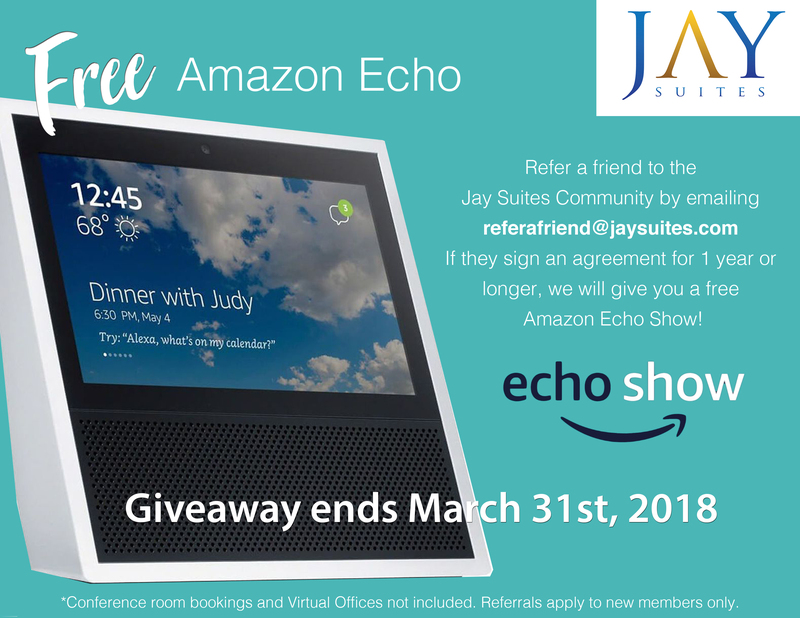 Refer a friend to Jay Suites and all referrals that apply will be rewarded with a free Amazon Echo Show! Echo Show brings you everything you love about Alexa, and now she can show you things. Watch video flash briefings, Amazon Video content, see music lyrics, security cameras, photos, weather forecasts, to-do and shopping lists, browse and listen to Audible audiobooks, and more. All hands-free—just ask. Ask Alexa to turn on lights or the TV, set thermostats, control Amazon Video on Fire TV, and more with WeMo, Philips Hue, Sony, ecobee, and other compatible smart home devices. Always getting smarter and adding new features, plus thousands of skills like Uber, Allrecipes, CNN, and more! How to enter: Do you know someone in need of office space? Let us know! Email us your referral at referafriend@jaysuites.com. Spread the word about us to your friends and colleagues, if they agree to a one-year contract from your referral, we’ll give you a free Amazon Echo Show as a token of our appreciation! Referrals apply to new members only. Jay Suites is a hub for New York City entrepreneurs looking to simply work better. We offer flexible, luxury office suites, virtual office plans and on-demand conference rooms, so you can focus on your business and leave the rest to us. All Jay Suites offices are furnished, elegantly designed and come equipped with state-of-the-art technology, resources and support. In addition, members join a growing community with perks such as exclusive access to our members-only meet ups. With locations throughout midtown and downtown New York City, we have crafted an all-inclusive office package so that you can project your company’s expenses forward. Whether you’re a lawyer, technology startup, or a fortune 500 company, you can bank with Jay Suites to thrive with our customized office space solutions.